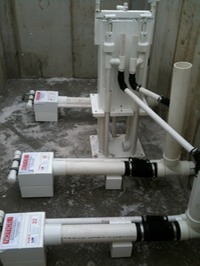 This 22 inch drawdown system has three, 3" pipe Flouts and 4" built-on shims. This section covers details for implementation of Cuebox arrangements. Get familiar with Flout Basics before proceeding. A Cuebox Flout is longer than a regular Flout. The minimum chamber length for 3" Flouts with internal venting is DD plus 30 inches. With external venting, it's 18 inches. The minimum chamber length for 4" Flouts with internal venting is DD plus 36 inches. With external venting, it's 24 inches.